This article is about the city in Guizhou. For the bridge in Chengdu, see Anshun Bridge. Anshun (simplified Chinese: 安顺; traditional Chinese: 安順; pinyin: Ānshùn) is a prefecture-level city of Guizhou province, near the location of Huangguoshu Waterfall, the tallest in China. Within the borders of its prefecture there are attractions such as The Long Gong Dragon Caves and The Getu River. As of 2010, it had a population of 2,297,339. The city proper had a population of 765,313. The city is known for its aerospace industry. Anshun has a long history dating back to the Western Han dynasty around 200 B.C. There are two special kinds of culture which existed in Chinese history: Tempu and Yelang. The Tianlong Tunbao town is close to Anshun city. Tunbao is a town with a long history which includes eight small areas. Each one is connected with each other since it was a main war place from the period of Ming Dynasty. The culture of Tunbao is unique and traditional. First, the traditional clothes are special which are designed respectively from head to foot. Second, ‘Nuo’ is a kind of drama which originated in Tunbao. The performers wear masks and hold the stage property for performing. The plots of drama are all from the legends of history. Third, local stone architectures are representative for long history of Tunbao. Anshun's administrative area spans latitude 25° 21'−26° 38' N and longitude 105° 13'−106° 34' E and contains sizeable areas of karst formation. 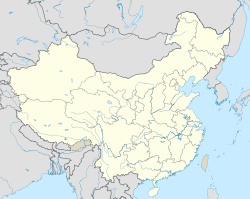 It borders Guiyang, the provincial capital, and Qiannan Buyei and Miao Autonomous Prefecture to the east, Liupanshui to the west, Qianxinan Buyei and Miao Autonomous Prefecture to the south, and Bijie to the north. Within the prefecture, the elevation ranges from 1,102 to 1,694 metres (3,615 to 5,558 ft). Anshun has a monsoon-influenced humid subtropical climate (Köppen Cwa) bordering on a subtropical highland climate (Köppen Cwb), tempered by its rather high altitude and having frequent rain (falling on just over half of the days of the year) and high humidity year-round. Winters are short, cool and damp, while summers are very warm. The monthly 24-hour mean temperature ranges from 4.5 °C (40.1 °F) in January to 22.0 °C (71.6 °F) in July, and the annual mean is 14.22 °C (57.6 °F). Over two-thirds of the annual rainfall occurs from May to August. Note: Xixiu District includes one subdistrict and two towns of the Anshun Economic Development Zone, while the two towns of Huangguoshu Scenic Area, Huangguoshu (黄果树镇) and Baishui (白水镇), are administered by Zhenning and Guanling Counties, respectively. According to the Sixth National Population Census of the People's Republic of China conducted in 2010, the residence population was 2,297,339, a reduction of 34,402 (1.48%) from the Fifth Census in 2000. The male-female ratio was 107.34 males per 100 females. Persons aged 0–14岁 numbered 580,910 (25.29%), 15–64 numbered 1,516,977 (66.03%), and 65+ numbered at 199,452 (8.68%). The urban population was 690,138 (only 30.04%). Among the residence population, there were 1,466,833 people of Han ethnicity (63.85%), with members of various other ethnic groups taking up the other 36.15%. Rail: Guiyang–Kunming Railway (贵昆铁路); Shanghai–Kunming Railway is under construction. Air: Anshun does have its own airport, although flights and destinations are limited from Anshun Huangguoshu Airport (黄果树机场). Destinations are to Chongqing, Guangzhou and Beijing's lesser Nanyuan Airport. Most travelers choose to use Guiyang Longdongbao International Airport and take a coach between there and Anshun. Other: Shanghai–Kunming High-Speed Railway and China National Highway 320. Anshun Normal University is the largest local institution of higher education, hosting Peace Corps Volunteer TEFL teachers since 2005. Huangguoshu Waterfall ("Yellow Fruit Tree Waterfall") : A waterfall that can be viewed from all angles, even from inside the waterfall. It is the biggest waterfall in Asia. Getu River : the river is situated in a mountainous karst area. Along the river one can find Miao villages and karst caves. It is possible to walk 2000 steps up to the Chuangshang cave where one can get a view of the whole area. Longgong Cave (龙宫洞; "Dragon Palace") : The cave is situated above sea level and one has to walk 200 meters upwards to reach it. From there one can sail into the cave and experience the stalagmites and stalactites of the karst formation. There is also a waterfall by the foot of the cave. Tianlong Tunbao (屯堡) Ming Dynasty Town : The town is situated some 25 kilometres (16 mi) from downtown Anshun. The name Tunbao refers to the places where the troops were stationed to guard the frontiers after putting down the riots during their southern expedition to Guizhou in the Hongwu reign (1368–1398) of the Ming Dynasty. The citizens have stuck to their traditional customs since then. The locals still wear clothes from the Ming Dynasty and the houses are also from that era. Anshun Wenmiao : This Ming Dynasty Confucian temple, situated within Anshun city, is erected to honor the famous philosopher Confucius and his disciples. Zhongdong (中洞; Middle Cave): Twenty families live inside this isolated village, set in a humongous limestone cavern 1,800 metres (5,900 ft) up a mountain. It's thought to be the only year-round settlement inside a naturally occurring cave in China. Tiantai Mountain : The mountain lies in Tunbao tourist site. It has a history of approximately 421 years. It is the only one ancient architectural complex in Guizhou Province which is the imitation of Song-Dynasty-style. The architectural complex is called The Epic of Stone Architectural. Ming general Wu Sangui once resided here. Huajiang Canyon : The only canyon which is famous as the "earth surface crack" canyon. Cliffside inscriptions are in the canyon. Anshun Batik - Batiks are a traditional folk Chinese handicraft art of Buyi Minority. People use wax pen to draw various patterns on white cloth such as flowers, birds and some strange shapes. Then, the cloth will be dipped dyeing in the indigotin. Finally, the patterns will be white shapes on a blue ground. Baktis can be used to make dresses and some other daily used things. Dixi Opera - Dixi Opera is called the "living fossil of Chinese Opera". The acting style is singing and dancing. The main feature is that all actors wear the xylographic masks and sing the opera which are the ancient style. Wikivoyage has a travel guide for Anshun. Wikimedia Commons has media related to Anshun.